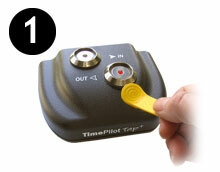 TimePilot timeclocks: How Does TimePilot Tap+ Work? How Does TimePilot Tap+ Work? The battery-powered clock can be kept in a truck, a briefcase or a pocket. Employees clock in and out with a tap of their iButton. To collect data from your Tap+, simply plug the included USB cable into the device and into the PC running the TimePilot software. The data will download automatically and the clock’s battery will recharge. You can use the clock cable-free (as above), or you can keep it tethered to the PC with the included USB cable. When it’s tethered, employees’ clock-ins and outs will appear in the TimePilot software instantly. Let the TimePilot software—your choice of TimePilot Professional or TimePilot Enterprise—handle all the calculations and prepare the data quickly and accurately. You can also modify, add or delete employee clock-ins and clock-outs. When you’re ready, print out reports or export your data to payroll services or software like ADP or QuickBooks. When employees tap their iButtons to the battery-powered Tap+, the clock saves three things to its memory: the iButton’s serial number (which identifies the employee), the time and date and whether it’s a clock-in or a clock-out. The clock’s memory can handle up to 12,000 clock-ins and clock-outs. Its battery should last a year before it needs to be recharged. When it’s time to do payroll, you’ll move those clock-ins and clock-outs from the clock to the TimePilot software. That’s done by first starting up the “TimePilot Tap Manager,” which is a small software program that acts as the go-between for your Tap+ clock and your computer. Then you connect the Tap+ clock to your computer with the included USB cable. Immediately, the Tap Manager moves the clock-ins and clock-outs into the TimePilot database on your computer (or on your server—you choose the location when you set up the software). And at the same time, as long as the clock is connected by cable to the computer, the battery is being recharged and the date and time on the clock is synchronized to match the time on the computer. To see the clock-ins and clock-outs (also called "Transactions”), start the password-protected TimePilot software. It performs all the calculations and lets supervisors correct, insert and delete clock-ins or clock-outs, as well as create reports and prepare the data for payroll.